In order to know the mind of the ancient Egyptians, we must have a working knowledge of their language. Hieroglyphs, the writing of ancient Egypt indigenously called Sesh Medew Netcher, have been around for thousands of years. They are fascinating to look at, because many of the signs are recognizable as pictures of people , , , , parts of the body , , animals , , , , birds , , , , fish , , insects , , and plants , , while others seem at first glance positively strange , , . Put together in rows and columns, these hieroglyphic symbols form an infinite variety of patterns that were an important part of ancient Egyptian culture. Some can be written quite simply, while others are minor masterpieces in themselves, but these hieroglyphs were not just pictures: to those who could read them, they were a sophisticated system of writing used for accounts, historical records, stories, love poetry, science, ritual, astronomy, mathematics, treaties, and much more. 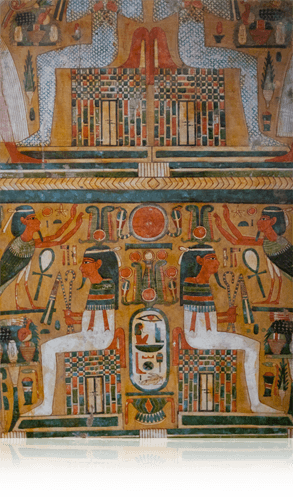 Today, hieroglyphs are found in huge numbers carved and often painted in bright colors on the walls of temples and tombs in Egypt, as well as on many objects such as coffins, statues, papyri, pottery vessels and mummy bandages in museums all over the world. Along with the pyramids and sphinx, hieroglyphs are the most easily recognized symbols of ancient Egypt, and some of them, such as (the ankh, a symbol of life), are now so frequently used as charms and pendants that their origins are sometimes forgotten. There are thousands of Egyptian hieroglyphs, although around 500-700 of them were much more commonly used than the others. Even so, the thought of learning to read hieroglyphs can be daunting. The aim of this website is to give a very straightforward introduction for anyone first encountering hieroglyphs — for beginners, students, tourists wanting to get more out of their trip to Egypt, and for anyone interested in ancient Egypt and ancient languages. We accomplish this by providing study courses, articles related to language and Egypt in general, pictures of Egyptian artifacts, and a wealth of resources to assist in learning the ancient Egyptian language. We have user-friendly online courses at Seba University that are compatible for desktops and mobile devices. The information provided for each course includes: Contents, Description, Price, Exercise Files, Teacher, and Requirements. Navigation through the course is done on the Contents tab where each lesson is a clickable link along with easy to use navigation buttons. The student interface allow students to view their courses, quizzes, test scores, and certificates. Students receive a certificate of completion and confirmation of proficiency upon passing final exams of selected courses.